In a bowl: add gram flour, rice flour, cumin powder, coriander powered, turmeric powder, red chilli powder, dry mango powder and salt. Add broccoli and fry it for 2-3 minutes on low-medium flame, keep stirring. 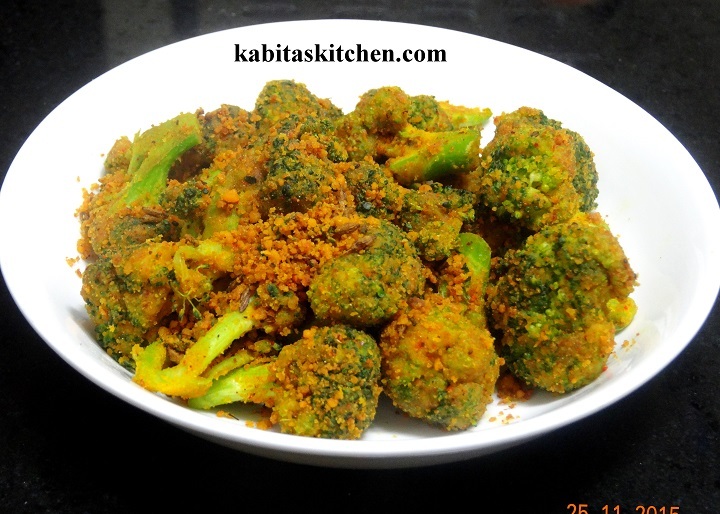 Add prepared masala mixture to the fried broccoli, keep stirring. Fry it for 3-4 minutes on low-medium flame (do not cover the pan). Once the masala coated broccoli turned golden brown, turn off the flame. Turn on the flame and heat a pan, add peanuts and roast it for 2-3 minutes on low-medium flame. Take out the roasted peanuts in a blending jar and let it cool down a little. Coarsely grind the roasted peanuts(do not grind it into powder) and keep it aside for further use. In a blending jar: add ginger, green chilli, garlic onions and little water, blend it into smooth paste. Cut all the brinjals from middle, keep the attached stem intact. Heat a pan, add little oil and let it heat. Add brinjals and fry it for 2 minutes on medium flame, keep flipping. Take out the fried brinjals in a plate and add little oil in the same pan. Once the oil is heated, add cumin seeds and fry it for few seconds. Mix it and cook it for 30-40 seconds on low flame, keep stirring. Add blended masala paste, fry the masala for 2-3 minutes on low-medium flame, keep stirring. Add grounded peanuts and mix it with masala, add one glass of water and mix it. Add salt to taste, mix it, increase the flame to high and let the curry come to boil. 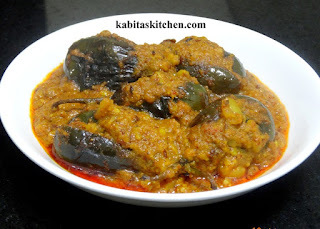 Add fried brinjal into the curry, mix it, cover the pan and cook it for 15-18 minutes on low flame. Add garam masala powder and stir it, cover the pan and cook it for another minute on low flame. Grate the paneer in a bowl and add boiled potato in it, mash the potatoes with grated paneer. Add little salt, red chilli powder, garam masala powder and maida, mix it well. Knead the mixture for a minute and make a dough. Take a small portion of mixture and roll it into small ball, press inside with thumbs to make bowl shape. Stuff little dry fruits inside the ball, seal the edges properly and roll it into ball again. Dust it with little maida and keep it aside for frying, make all the balls in the same way. Heat oil in a frying pan, put 3-4 balls at a time. 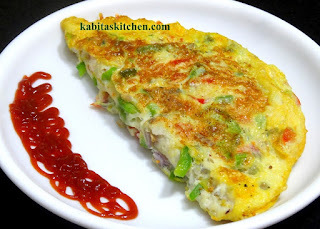 Fry it on low-medium flame till it turns golden brown, keep flipping to cook all sides. Take out the fried kofta on kitchen towel and keep it aside. Heat a pan and add butter, once the butter has melted, reduce the flame to low. Add almond, cashew, ginger, garlic, green chilli and onion, fry it for 2 minutes on medium flame. Add chopped tomato, fry the tomato on medium flame till it turns soft ( 2-3 minutes). Turn off the flame, take it out in a blending jar and let it cool down. Blend it into thick smooth paste (do not add water), take it out in a bowl and keep it aside for further use. Heat a pan, add dry fenugreek leaves and roast it for few seconds on low flame. 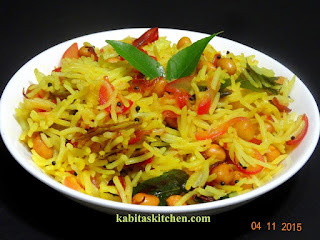 Take out the roasted fenugreek leaves in a plate and keep it aside for further use. Add 2 tbsp oil in the same pan, once oil is heated, reduce the flame to low. Add turmeric powder, red chilli powder, coriander powder and cumin powder, fry for a minute on low flame. Add the prepared masala paste, and fry it for 2-3 minutes on low flame, keep stirring in between. Add one glass of water and salt to taste (Remember, we had already added salt in kofta). Cook it for 2-3 minutes on low-medium flame, add fresh cream, mix it and cook it for one more minute. Add garam masala powder, roasted kasuri methi, mix it properly in the curry. 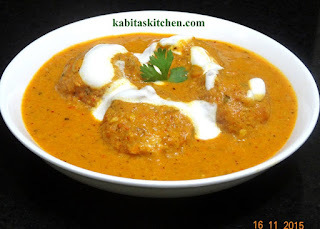 Turn off the flame and let the curry cool down a little, add fried kofta in the curry and mix it. Ready to serve, you may garnish with fresh cream before serving. Boil the milk on low flame till it reduces to half of its original quantity (i.e. 1/2 litre). Add sugar, cashews, pistachios, almonds and saffron, mix it well. Boil it on low flame till it reduces to 1/4 of its original quantity(i.e. 1/4 litre), keep stirring in between. Turn off the flame after milk has reduced to 1/4 of its original quantity, let it cool down a little. Cut the bread slices into round shape using a steel glass or any cookies cutter. 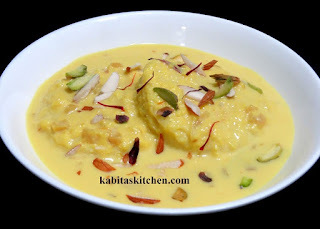 Take two bread slices at a time and dip it into the malai, leave it in malai for 40-60 seconds. Take out the soaked bread slices along with the malai milk in a serving plate. Garnish it with almond, pistachio and saffron, ready to serve. You may serve it immediately or serve it after keeping in fridge for 2-3 hours. Roast the peanuts for 2 minutes on low-medium flame and keep it aside. Heat a pan, add oil and and let it heat properly. Add mustard seeds, dry red chilli and green chilli, fry it for few seconds. Add curry leaves and chopped onion, fry it on medium flame for 2 minutes. Add roasted peanuts, turmeric powder and salt to taste, mix it and cook for 1/2 minute on low flame. Add lemon juice and mix it, Cook it for 1/2 minute on low flame. Add boiled/cooked rice and mix it gently, cover the pan and cook it on low flame for 1-2 minutes. In a bowl, add sugar and water and let it come to boil on medium flame. Once the syrup starts boiling, add lemon juice and cardamom powder, stir it. Reduce the flame to low and boil it for 15 minutes on low flame. In a bowl; add milk powder, maida, baking soda and mix it well. Add ghee and mix the mixture properly. Add 4 tbsp of milk and knead the mixture into dough. 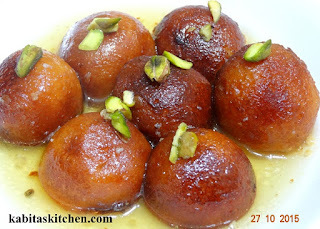 Grease your palm with few drops of ghee and make small balls of the dough. Balls are ready to fry. Heat ghee in a frying pan, put the balls in it, put 3-4 balls at a time. Fry it on low flame till it turns brown, keep flipping. Turn on the flame and put the sugar syrup on it. Put the fried balls in the sugar syrup one by one. Boil the balls in the sugar syrup for 10-12 minutes on low flame, keep flipping the balls in between. Turn off the flame, it is ready to serve. Break the eggs into a bowl and whisk it. Add chopped vegetables and salt to taste, mix it well. Heat a frying pan, add oil and let it heat. Once the oil is heated properly, reduce the flame to low. Gently pour 1/2 of the egg mixture in the pan( spread it evenly). Cook it on low flame for a minute, gently flip it to cook other side. Grate cheese on the cooked side and sprinkle Italian herds on it. Fold it from the middle and cook it for 1-1.5 minutes on low flame (keep flipping). Add little turmeric powder and salt to the prawns. Mix it and keep it aside for 20-30 minutes. In a grinding jar:add 1/2 tsp od cumin seeds, coriander seeds, whole black pepper, ginger, garlic,green chill and chopped onion. Heat a pan, add 2 tbsp of oil and let it heat. 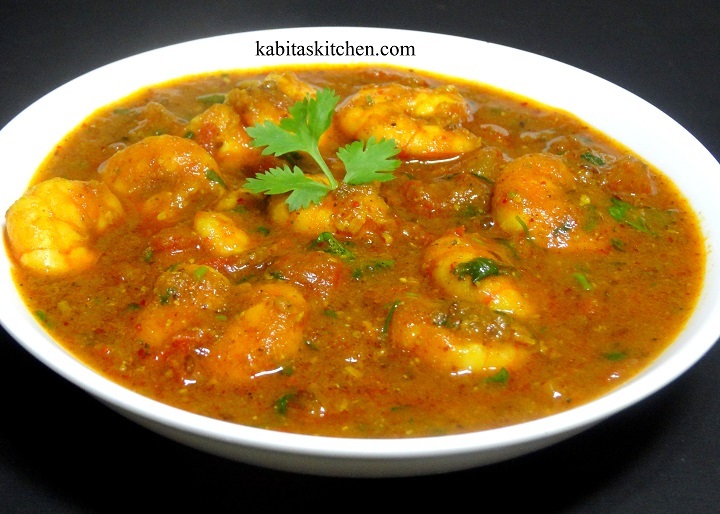 Fry the marinated prawns for a minute on medium flame. Take out the fried prawns, keep it aside for further use. Add 2 tbsp oil in the same/different pan and let it heat properly. Add bay leaves and cumin seeds, fry it for few seconds. Add turmeric powder and red chilli powder, mix it. Add the prepared masala paste, fry the masala for 3-4 minutes on low-medium flame. Add chopped tomato and cook it on low flame for 4-5 minutes. Add 1/2 glass of water, stir it and let it come to boil. Add fried prawns and salt to taste, mix it. Cover the pan and cook it on medium flame for 4-5 minutes. Add garam masala powder and coriander leaves, stir it. Add black pepper, ajwain and salt into the flour and mix it properly. Add ghee and mix it in the flour for a minute. Add water and knead the flour into dough(dough should be a little stiffer than the chapati dough). Cover the dough and leave it for 15-20 minutes. Take a portion of the dough and roll it into chapati shape with rolling pin. 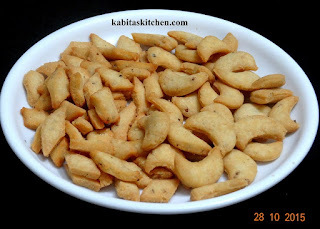 Cut it into diamond shape chunks with knife and take out in a plate. Put one namakpara into the oil to check the temperature of oil. Put the small portion of namakpara into the hot oil carefully. Fry it on low-medium flame till it turns golden. Repeat the frying steps to fry the remaining namakparas.